Azden's most popular DSLR audio products are now compatible with Smartphones and Tablets! The WLX-PRO+i includes a new interface cable making it compatible with any mobile device with a TRRS jack. Record great wireless audio into your iPhone 3/4/5/6, iPad (3rd generation and newer), Samsung Galaxy S 3/4/5, Galaxy Tab 3 and most Android devices. 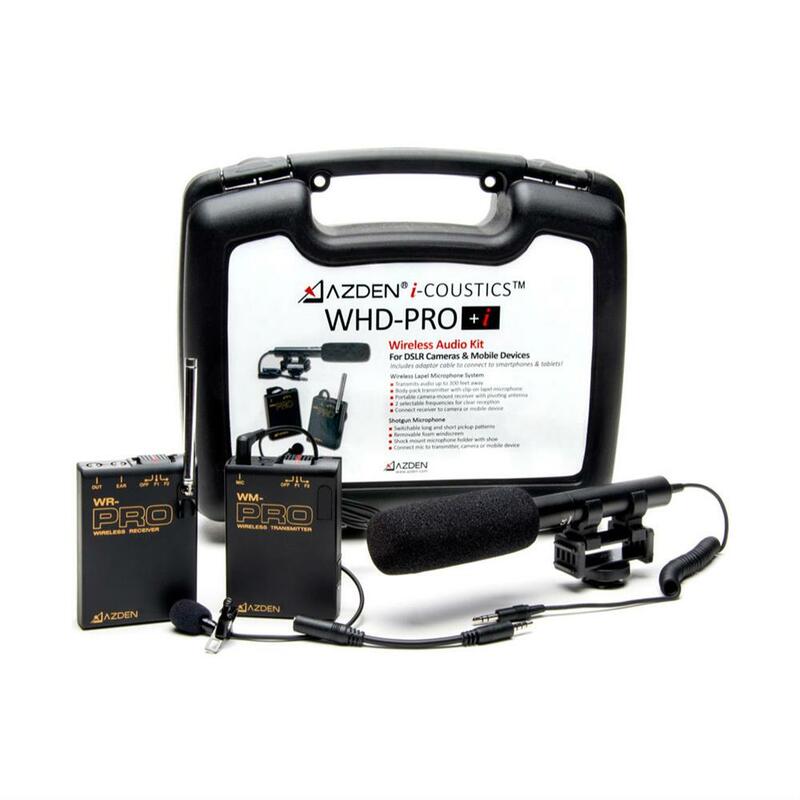 A complete videographer's audio solution, the WHD-PRO+i combines Azden's very popular wireless lavalier audio kit and DSLR microphone. The WHD-PRO+i comes with a custom hard-shell carrying case for easy portability. The WL/T-PRO combines the WM-PRO body-pack transmitter with the EX-503 electret condenser omni-directional lavalier microphone. This is the standard 2 frequency switchable (169.445MHz and 170.245MHz) body-pack transmitter for all "PRO" series receivers. Uses a single 9V alkaline battery and comes with a belt-clip. The SGM-990 is a 6&#8243; long directional, or "zoom" microphone with 2 switchable sound pick-up patterns, "Long" and "Short." Use "Long" to focus on your sound source or pick up sound from a distance. Use "Short" for when your sound source is close or covers a broader field. Both settings will provide rejection of unwanted sound from the sides and the back. The SGM-990 has a working range of 20-40 feet, uses 1 "AAA" battery, and comes with a windscreen, shoe mount and hook-and-loop mounting tape.